Six weeks ago there was an article by one of our products in Long Learning, the journal of the Long Fund. It was a spontaneous article in the "tip of the reader" a patient with COPD who are already half a year has a lot of benefits from the Salt Pipe (see www.saltpipe.nl), the porcelijnen inhaler with Halit salt from the ancient mountains on the border of Hungary and Romania. This product has been more than 5 years in our range and many people with breathing problems (such as asthma, COPD, allergies, snoring, anxiety, etc) used this product for many with "relief". 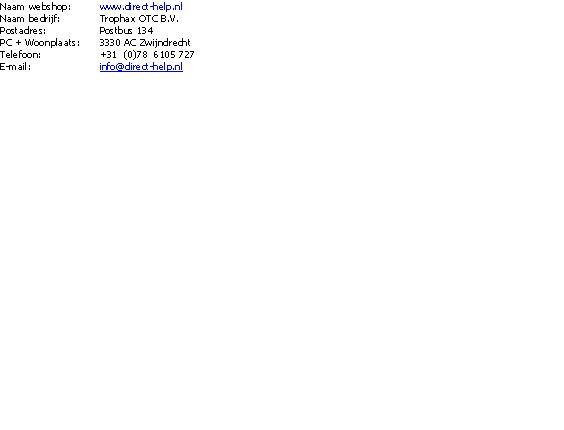 For more information http://www.direct-help.nl/nl/gezondheid/ademhalingsproblemen. For colds, smoker's cough, pollen and other allergies, clogged bronchial, flu, etc. What does the Salt Pipe ™? The micro-fine salt particles mix with the moist breath and thus flows into the respiratory system where it loosens phlegm and still no side effects! Therefore, the Salt Pipe ™ is also suitable for pregnant women or patients who take medication for their respiratory disorders. When the cleaning Respiratory begins, one can experience while coughing or sneezing that breathing passages are freer. How is the Salt Pipe ™ used? Just do it in your mouth and inhale. You can do about 25 minutes a day, but then spread throughout the day. For detailed information please visit our website www.saltpipe.nl right. Also, this site has a lot of reference and clinical information on the Salt Pipe ™. Ingredients: The Salt Pipe ™ contains 50 to 60 grams of granulated salt (Halit called) of the middle part of the Miozän Mountains, divided in sodium chloride, calcium sulfate, magnesium chloride, calcium chloride, iron oxide, and traces of potassium, iodine and bromine. These ingredients are sufficient for 5 years' use of the Salt Pipe ™.